Lavender essential oil is one of the most popular and versatile essential oils used in aromatherapy. Distilled from the plant Lavandula angustifolia, the oil promotes relaxation and believed to treat anxiety, fungal infections, allergies, depression, insomnia, eczema, nausea, and menstrual cramps. In essential oil practices, lavender is a multipurpose oil. It is purported to have anti-inflammatory, antifungal, antidepressant, antiseptic, antibacterial and antimicrobial properties, as well as antispasmodic, analgesic, detoxifying, hypotensive, and sedative effects. Lavender essential oil and its properties have been widely studied. Here's a look at the research. While there's currently a lack of large-scale clinical trials testing lavender's effects on people with anxiety, a number of studies show that the oil may offer some anti-anxiety benefits. Several studies have tested lavender's anxiety-reducing effects in specific populations. For example, a study published in Physiology & Behavior in 2005 focused on 200 people awaiting dental treatment and found that breathing in the scent of lavender both lessened anxiety and improved mood. In addition, a pilot study published in Complementary Therapies in Clinical Practice in 2012 indicates that lavender-essential-oil-based aromatherapy may help soothe anxiety in high-risk postpartum women. In an experiment involving 28 women who had given birth in the previous 18 months, researchers found that four weeks of twice-weekly, 15-minute-long aromatherapy sessions helped alleviate depression in addition to lowering anxiety levels. There's also some evidence that ingesting lavender oil may help relieve anxiety. In a report published in Phytomedicine in 2012, for instance, scientists analyzed 15 previously published clinical trials and concluded that dietary supplements containing lavender oil may have some therapeutic effects on patients struggling with anxiety and/or stress. Several studies have shown lavender essential oil may help promote sleep and fight insomnia. A 2015 study published in the Journal of Complementary and Alternative Medicine found a combination of sleep hygiene techniques and lavender essential oil therapy helped college students get a better night's sleep than sleep hygiene alone. The study of 79 students with self-reported sleep problems also found inhaling lavender at bedtime improved daytime energy and vibrancy. A 2018 study published in Holistic Nursing Practice confirms lavender's effect on sleep. 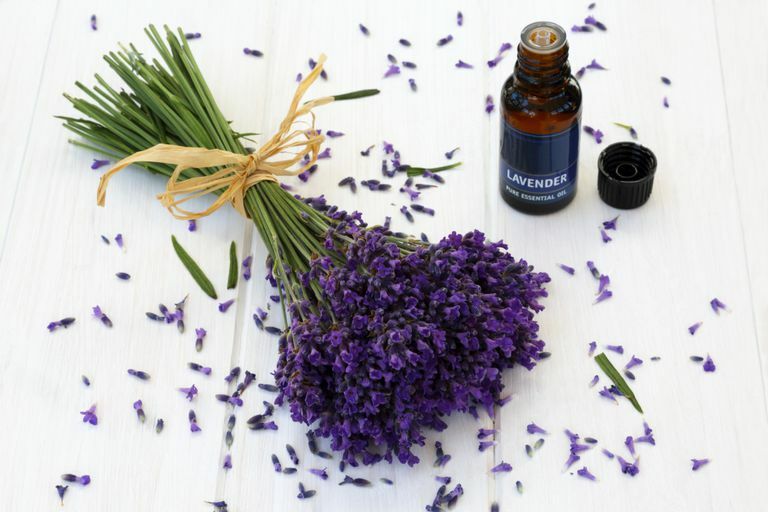 In this study of 30 residents of a nursing home, lavender aromatherapy was found to improve sleep onset, quality, and duration in an elderly population. Lavender essential oil may cause skin irritation or an allergic reaction in some individuals. If you experience nausea, vomiting, or a headache after using lavender, discontinue use immediately. Because consuming lavender essential oil can have toxic effects, this remedy should not be ingested unless under the supervision of a medical professional. There is no recommended daily allowance for lavender essential oil. According to the principles of aromatherapy, breathing in the scent of lavender essential oil or applying lavender essential oil to the skin transmits messages to the limbic system, a brain region known to influence the nervous system and help regulate emotion. One popular approach involves combining lavender oil with a carrier oil (such as jojoba or sweet almond). Once blended with a carrier oil, lavender essential oil can be massaged into your skin or added to your bath. You can also sprinkle a few drops of lavender essential oil onto a cloth or tissue and inhale its aroma, or add the oil to an aromatherapy diffuser or vaporizer. Essential oils are not regulated by the FDA and do not have to meet any purity standards. When purchasing essential oils, look for a supplier who either distills their own material or deals directly with reputable distillers, and uses gas chromatography and mass spectrometry (GC/MS) to analyze the quality of the product. When buying pure lavender essential oil, check the label for its Latin name, Lavandula angustifolia. No other oils or ingredients should be listed. If you see another oil, such as fractionated coconut oil, jojoba oil, or sweet almond oil, the lavender is diluted and should not be used in a diffuser. Essential oils should be packaged in a dark amber or cobalt bottle and stored out of sunlight. Can lavender essential oil treat allergies? Many essential oil proponents recommend using a combination of lavender, lemon, and peppermint oil to relieve allergy symptoms, and claim that lavender is a natural antihistamine. However, there is no scientific evidence to support this claim. Will adding lavender oil to my mascara make my lashes grow faster? Adding lavender oil to mascara is purported to help lashes grow thicker and faster. The theory behind this is that tiny mites live on and feast on eyelashes inhibiting growth, and using lavender to kill the mites will allow lashes to grow faster. There is no scientific evidence to support this claim. Is lavender essential oil a cure for baldness? A few studies over the years have suggested that lavender oil may reverse hair loss. A 2016 study on mice found that lavender essential oil may promote hair growth for people with alopecia or male pattern baldness. An earlier study found a combination of lavender, thyme, rosemary, and cedarwood essential oils may promote hair growth. While lavender may help soothe mild anxiety, it should not be used in place of professional mental health treatment for any type of anxiety disorder. If you're experiencing symptoms of anxiety such as constant worrying, fatigue, insomnia, and rapid heartbeat, make sure to consult your primary care provider rather than self-treating your anxiety with lavender. Lee BH, Lee JS, Kim YC. Hair Growth-Promoting Effects of Lavender Oil in C57BL/6 Mice. Toxicol Res. 2016;32(2):103-8. doi: 10.5487/TR.2016.32.2.103. Hay IC, Jamieson M, Ormerod AD. Randomized trial of aromatherapy. Successful treatment for alopecia areata. Arch Dermatol. 1998;134(11):1349-52. Lillehei AS, Halcón LL, Savik K, Reis R. Effect of Inhaled Lavender and Sleep Hygiene on Self-Reported Sleep Issues: A Randomized Controlled Trial. J Altern Complement Med. 2015;21(7):430-8. doi: 10.1089/acm.2014.0327. Faydalı S, Çetinkaya F. The Effect of Aromatherapy on Sleep Quality of Elderly People Residing in a Nursing Home. Holist Nurs Pract. 2018;32(1):8-16. doi: 10.1097/HNP.0000000000000244. Can Inositol Relieve Panic and Anxiety? Can Mahanarayan Ayurvedic Massage Oil Melt Away Sore Muscles? How Can Aromatherapy Massage Help You?